Following on from my earlier posts concerning the availability of the RHEL 8 Beta and having taken a Backup with Clonezilla of my ThinkPad P1 I thought it was a good opportunity to test RHEL 8 on this new laptop. Setting up RHEL 8 on the laptop was surprisingly simple. Follow the RHEL 8 Beta README to download the Bootable ISO image. (*) Important! As of December 2018 some users on the X1 Carbon Extreme and the ThinkPad P1 have encountered problems when they change the graphics settings in the BIOS. See WARNING – Do not change from “hybrid graphics” to “discrete graphics” in BIOS for more details. The RHEL 8 installer was able to boot fine on my device with version 1.13 of the BIOS. Newer revisions of the BIOS have since been released and can found at Lenovo ThinkPad P1 BIOS downloads or applied from Lenovo Vantage. Unlike the Fedora 29 release I tried, I did not need to use any ACPI boot flags with the installer, and the nouveau drivers appear to work just fine. I selected the desktop software selection which installs Gnome 3.28. After you are up and running, there are a couple of steps to perform to allow you to download additional packages (it’s not clear whether Red Hat will provide errata to the Beta). If you manually configure the static repos – there is no need to register at the Red Hat portal. Enable repos for your architecture by setting the relevant ‘enabled’ line to 1. Here I’ve enabled the baseos, appstream and HA (High Availability) repos. You can register the installation with the Red Hat portal with subscription-manager register. A free developer account allows you to do this – there is no charge to get one of these. 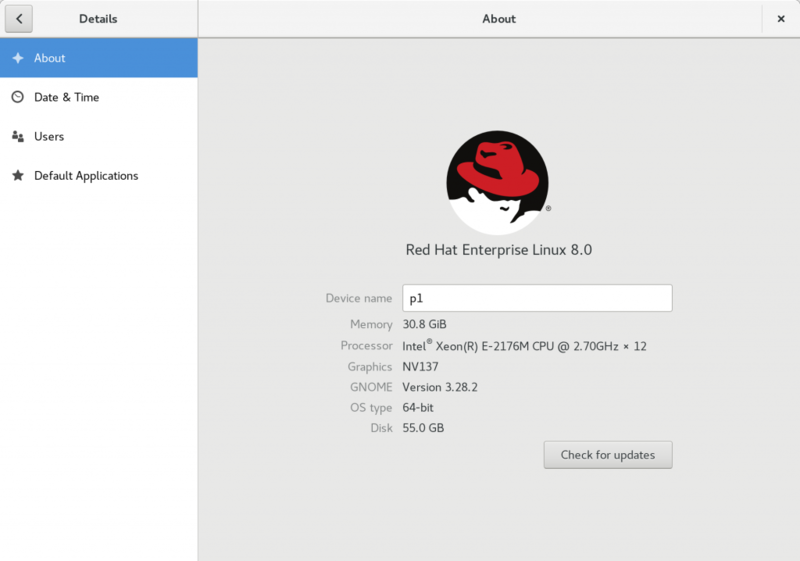 Once registered you can grab yourself a Red Hat Enterprise Linux Server Beta subscription by following the steps on the Get RHEL 8 Beta page. Be patient, the subscription didn’t appear in the portal straight away but was there when I checked around an hour later. Status Details: Not supported by a valid subscription. 1 local certificate has been deleted. 1 subscription removed at the server. RHEL 8 makes for a great, modern desktop. On the hardware side there are a few things which don’t work out of the box. The Fingerprint reader doesn’t appear to be supported yet. Binaries for TLP – Linux Advanced Power Management aren’t available yet. This means that things like battery charging thresholds don’t work. Function keys to change the brightness of the display don’t work. Selecting ‘hybrid graphics’ from the BIOS results in a black screen. I’m not too surprised at this – this is a brand new laptop which I intend to keep for many years, so I’m sure these features will be added over time. Next up, a look at the new features in RHEL 8!